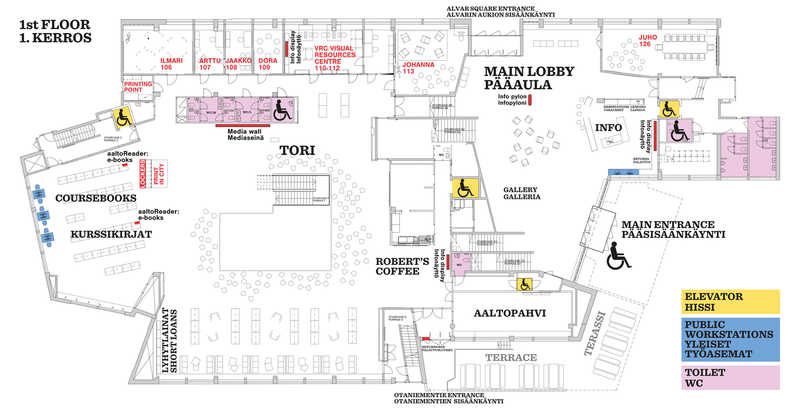 The 1st floor lobby of the Harald Herlin Learning Centre is all about Alvar Aalto’s legacy of the library building. After renovation the space has become the new customer service point, and in addition there is an exhibition venue. All exhibitions and events in the lobby are arranged exclusively via our curated programme. During all events the normal activities of the Learning Centre should not be disrupted. Customers can come and go in the space and get books from the collections etc. Before hosting an event or exhibition please study our guidelines carefully. Two rooms for ~20 people with projectors & sound for rent.